As it happens, I haven’t needed to do too much data fiddling in the last year or so and I know I have become a little rusty. This sent me around in rings. A quick export, fix a dozen rows and then import it back in. The data would not go back in using the flat file import export tool for MSSQL. Truncating error. I needed a quick macro I have written a dozen times to trim every cell in the sheet. Compile Error: Wrong number of arguments or invalid property assignment. What could I be getting wrong? Surely they haven’t changed the trim function in VBA? comment lines out, change things around, add a message to check what is going into the function. Blushing now on how dim I was, I had to share this. 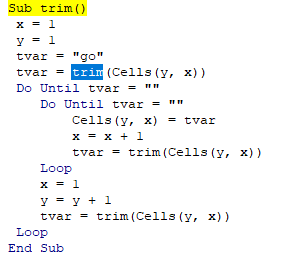 B) Because I realised that a lot of people can’t easily write a macro from memory to trim every cell and they might appreciate a working version. Notice for some dim, brain out of gear reason I gave the macro the same name as the Trim function. How many years programming knowledge? 40 years! I fell into using a reserved word for something. Do Until tvar = ""